Any plans like the proposed iron ring in Flintshire will not be approved while the current culture and tourism minister is in the job, he has said. 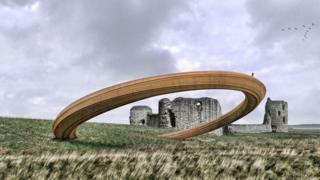 The plan for the sculpture, at Flint Castle, was scrapped by Welsh ministers in September, after complaints. Critics argued it had connotations with Edward I's "iron ring" of castles built to consolidate his conquest of Wales. Lord Elis-Thomas told BBC Cymru Fyw on Tuesday: "There won't be any swords or iron rings while I am minister." He also said that any success for the tourism industry in Wales over the next few years would be "despite", not because of, Brexit. In July, the Welsh Government announced a £630,000 investment in Flint Castle, which would have included the iron ring sculpture. The architects said that the landmark - at the location where Richard II surrendered the English crown to Henry IV - would be a "striking, iconic form" resembling a "giant ancient artefact, washed up on the shore of the Dee Estuary". But a Plaid Cymru AM described the sculpture as "insulting to Wales". Later it emerged that Welsh Government officials had foreseen the strong reaction to the development before choosing it. Lord Elis-Thomas, who took over responsibility for culture, tourism and sport portfolios in a cabinet reshuffle in November, said he has no appetite for projects of that nature in the future. That, he said, included statues such as the giant sword recently unveiled at the edge of Llyn Padarn in Llanberis. "I'm not a big fan of it - you'll have to ask Gwynedd Council about that one." On Monday, Lord Elis-Thomas launched "2018: Year of the Sea" - the third annual promotional theme to boost tourism in Wales. Recent figures have suggested a rise in the number of tourists from abroad visiting Wales, with the fall in the value of the pound since the EU referendum being cited as one possible factor. The minister insisted, however, that the tourism industry still had more reason to fear than embrace Brexit in the long run. "I don't think there's a single facet of the economy in Wales that will be better off from our decision to leave the European Union - that's why I voted to remain," he said. "Having said that, if we can remain part of the single market where what is on offer to everybody is reasonable and open, and if the door is still open for people from Europe and other parts of the world to come and work in the tourism industry, then our tourism offer will continue to thrive. "But I do think that it will be despite Brexit, not because of it," he said.